Dogs use the sound of their voices to communicate. 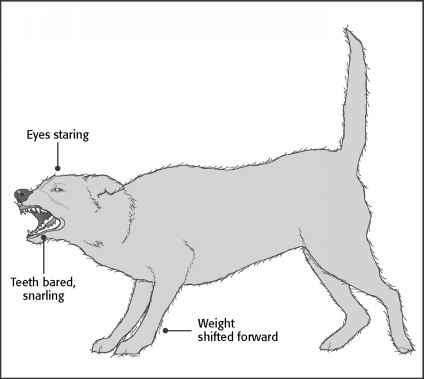 A high-pitched whine signals intimacy or fear, a flat bark is directional, and a loud growl or bark is often a warning or an invitation to play. Similarly, your dog responds to the tone of your voice. Confident directional sounds will get her attention and get her in the habit of looking to you for direction. Think of your commands as short, quick, directional barks. Soft, loving tones and high-pitched squeals are best used to reward your dog rather than direct her. Dogs translate high-pitched or excited tones as play tones or fearful whimpers. Save these tones for play periods or loving attention. Yelling is like barking to a dog. 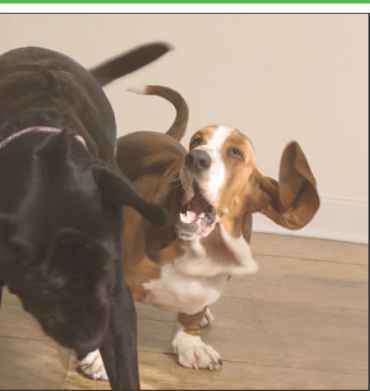 It is uncommon for one dog to charge another and bark repetitively in her face unless the dog is psychotic. It is especially confusing when you do it, since you are the person your dog wants to turn to when she feels threatened. Don't yell at your dog. It will not help in training her or strengthening your relationship. Many dogs look afraid when shouted at, but this is not understanding; it is fear. Your dog responds to the tone of your voice, not to the actual words. Once you repeat a command many times, she will respond to the sound of the word and understand how to react when she hears it. The direction of your voice is also important. If you stare at your dog and give her commands repetitively, she may feel overwhelmed. When your dog is exercising or playing, she won't be watching you so closely. When you give commands, either turn your body in the opposite direction or tilt your head upward. This will pique her curiosity, and she will look to you faster. For a quick lesson in Doglish, watch two dogs together, preferably around the same age. If they are already friends, they will have a preestablished pattern of play and interaction. If they have not met, introduce them in neutral territory. First, watch their eyes. Who is looking to whom? One should look to the other and follow her lead. Next, check out their body language. Relaxed poses say that all is well. If the dogs are tense, it is because they are trying to determine who should be in charge. The one who rolls over or crouches is saying, "You can be the leader." This is known as a submissive posture. Notice that the leader dog often puts her head or paws on top of the other's back. Some dogs are more vocal than others. Assertive growls and barks are another way to convey leadership, whereas playful yelps call out submission. Short, quick barks are often directional.